The Cazenovia College Art Gallery in Reisman Hall opens Thursday, September 1 with the Sabbatical Returns Exhibition, this year showing the work of Jo Buffalo, professor of art; Scott Jensen, associate professor of visual communications; Jen Pepper, associate professor of art; Allyn Stewart, assistant professor of visual communications; and Kim Waale, professor of art. Artist Reception, free and open to the public, will be held on September 1, from 4 to 5:30 p.m. will include lectures by the professors. The show runs through October 14. In 1981, Buffalo's work was featured in “New Works Clay III” at the Everson Museum of Art in Syracuse, New York. Not long afterwards, Buffalo set up her own clay studio. 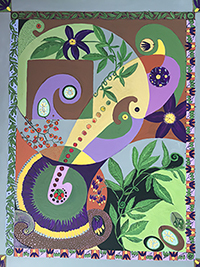 Her connection with the Everson Museum continued when, in 1985, they purchased a piece of her collaborative work with Chris Darling. Buffalo has been teaching at Cazenovia College since 1985, giving classes primarily in ceramic, drawing, and design. In 1997, through her association with the college, Buffalo was granted the James Renwick Fellowship in American Craft from the Smithsonian American art Museum, which funded her study of the ceramic collections at the Smithsonian Museums. During her sabbatical leave in the fall of 2009, Buffalo was a production apprentice at Moravian Pottery and Tile Works, during which time she created a new body of tiles in the studio provided. Buffalo's latest studio work has focused on incorporating knitting and glass into ceramic pieces, including the ever-populer ceramic fish. The sabbatical leave that I was granted in spring 2016 allowed me to return to painting and illustration. I have been working on a series of "plant portraits" that involve accurate portrayals of flora including dissections and habitat. The compositions have some referral to cubism in the sense they are multiple points of view. Art often reflects the natural world. It is a subject that never tires and a mystery profound. Associate Professor Scott Jensen received a BA degree in Mass Communications: Advertising Design/Photography from Lycoming College and an MFA in Advertising Design from Syracuse University. He joined the faculty at Cazenovia College full-time in 2008. He was previously associated with the visual communications program as a professional contact and adjunct instructor. He has worked as a corporate graphic designer and advertising art director, and continues to work professionally as both a marketing communications designer and illustrator. He has illustrated a line of humorous greeting cards for Oatmeal Studios since 1986, and writes and draws the Digby's Hardware comic strip for a national trade magazine. Jensen belongs to a number of professional design organizations, is on the board of the Mt. Utsayantha Rural Arts League, and currently serves as chairman of the Upstate NY Chapter of the National Cartoonists Society. He lives in Delaware County in New York State, where he raises chickens on the family farm. I have always found peace, and inspiration and perspective from the farm. A key benefit of sabbatical for me was actually being able to spend time on the farm during the fall. While the natural vistas, pastures and woods of the farm are certainly beautiful, and the animals pleasing in their own way, I find that it is the textures and tones of the manmade elements, as they have been affected by time and nature, that speak most loudly to me. This piece attests to the enduring beauty that can be found in the simple artifacts of a noble profession. Jen Pepper is an associate professor of Studio Art and Design and gallery director at Cazenovia College, where she has worked since 2003. She has exhibited in solo and group shows internationally since 1990. A solo exhibition of her work was mounted at the Everson Museum of Art, Syracuse, NY and reviewed in Sculpture magazine Vol.30 No.2, March 2011.
Pepper has been an awarded fellow at NEH, NYFA, NYSCA, and Astraea Foundation, among others. 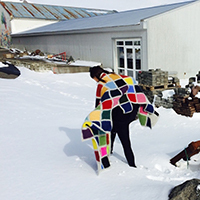 She has been an invited artist in residence to various programs in countries including Denmark, Iceland, Ireland, Macedonia, Norway, Ireland, and numerous peer review residencies throughout the USA. She is a graduate of The Maryland Institute College of Art in Baltimore (BFA) and The University of Connecticut in Storrs receiving her MFA. Allyn Stewart grew up as part of an extended army family and spent her childhood traveled around the world. She has lived in Cazenovia, New York since 1990 and has been teaching in the Visual Communications Program at Cazenovia College since the fall of 2000. Stewart has an M.F.A. in Art Media Studies from Syracuse University, Syracuse, NY; a M.A. in Museum, Editing and Archival Studies from Duquesne University, Pittsburgh, Pennsylvania; and a B.F.A. in Art History/Painting from Syracuse University. Prior to teaching full time, Stewart co-produced, directed, edited and videotaped a number of video documentaries: The Figure in the Landscape, (Stone Quarry Hill Art Park. Cazenovia, NY); From Sheltered To Integrated Work (Special Education Department, Syracuse University, Syracuse, NY); Women of Steel (Project Director and co-producer for Mon Valley Media, Pittsburgh, PA), and she was the Project Director and co-producer for Caring With A Contract which was produced in conjunction with the United Steelworkers of America International Union. In addition to her collaborative work in video, Allyn’s art videos have won numerous awards. Her video A Desperate Womanwas seen on national television through the program Through Her Eyes which was produced by The Learning Channel. Besides her creative endeavors in time-based media, Stewart's digital collages and artist books have been exhibited in a number of national and international venues. 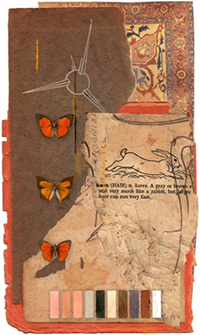 I have recently begun working on a series of small books titled A Cabinet of Curiosities. These books are a digital representation of the kind of wonderful and exotic found objects that were collected by travelers, naturalists, diplomats and royal monarchs centuries ago. In these books I intentionally pair unrelated images: plums are next to an ibex, ladders are opposite a dog, ferns face star maps and so forth. This placement reflects the kind of objects that could have been found in early sixteenth century cabinets of curiosities. The intention of these books is to create, for the viewer, a sense of wonder, of history and archaeology – of digging through the past. By turning the pages, the books become not just cultural artifacts but fragments of other places. When I was young, my grandfather pointed to a small patch of earth—a few inches square—and we closely examined it, naming everything we saw. It was one of those surprisingly formative experiences that not only revealed what is hidden in plain sight, but made me—at the time a small human—aware of my large footprint. This exercise in simple awareness informs my current sculpture. 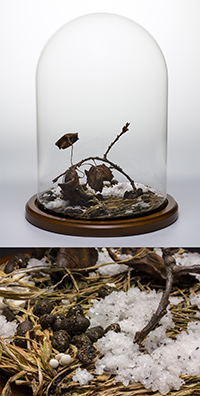 Displace is a series that reproduces, in 100% non-natural materials, under-foot landscapes from my immediate suburban environment. The subject matter is typically unseen and transitory (between seasons, rain or snowstorms or scheduled trash pick-up days). The time invested in painstakingly replicating these minute landscapes in long-lived unnatural materials (polymer clay, plastic, paint) is meditative. The simple act of placing them under glass domes, and the idea that they are works of art raises the value of the mundane, preserves the transitory, and provides a look at what is under our fast-moving feet.